Formlabs Sales and Operations Lead, Luke Winston, designed and 3D printed a unique engagement ring for his fiancée Raven. 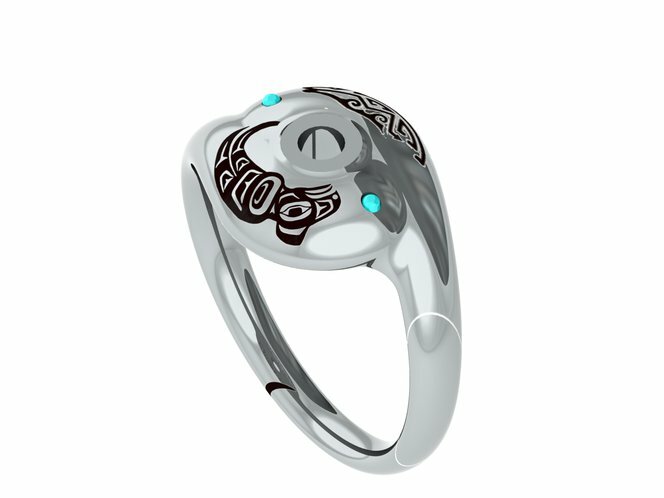 Centered around a diamond representing the sun, the ring combines the Tlingit Raven and the Zuni Wolf to incorporate both Luke and Raven’s heritage. I wanted the engagement ring to be uniquely significant to my fiancée Raven and I. Like any engaged couple, we have our individual identities as well as our history together. I wanted the ring to tell that story. Here's the tl;dr on us. Raven is half Tlingit from Northern Canada (way up there). As you can probably tell by her name, ravens are hugely significant to her culture, especially since the raven brought light to the world according to legend. By tradition, my fiancée Raven can’t marry into the same moiety, the Raven clan, as it would be seen as similar to marrying a brother. So, she would tease me that I would need to be a wolf to be able to marry her (i.e. of the Wolf moiety). Being a wolf sounds&hellip;awesome. The thing is, I'm from New Mexico. So I decided the right way to represent us both would be the combination of a Tlingit Raven with a Zuni Wolf (a pueblo tribe in New Mexico). At the center of the ring is a diamond that represents the sun that the raven gave to the world. Well, I had the idea above for a while&hellip;at least amorphously in my head. Luckily I know an excellent designer named Yoav Reches, who designed the Form 1 and led a benchtop manufacturing class at the Royal College of Art in London, among many other artistic endeavors. He and I sat for many sessions, taking care to make sure no other &ldquo;Formlings&rdquo; caught word of what we were working on. I first started by describing the idea, and then finding as many images as I could that represented the raven and the wolf. Yoav isn't a jeweler by training, but he is a wizard in Solidworks. He took me through many iterations of the design. This is a rendering of an early concept that had the ring actually taking the shape of each animal, with a gold bar or diamond connecting them both as their eyes. I loved that we could use Solidworks to have photo-realistic renderings of the ring in different metals. But on the screen it was enormous and out of context. So we printed this version on the Form 1+. The proportions didn't work. But we did like the idea of two sides of the ring coming together from separate worlds to form a continuous whole. So we moved to more of a flattened vortex on top of which we would have the wolf and raven engraved. At the center of the vortex is the diamond. After looking at the design a bit, I realized I felt that just having a diamond at the center was too traditional. So Yoav and I brainstormed how to add more character. 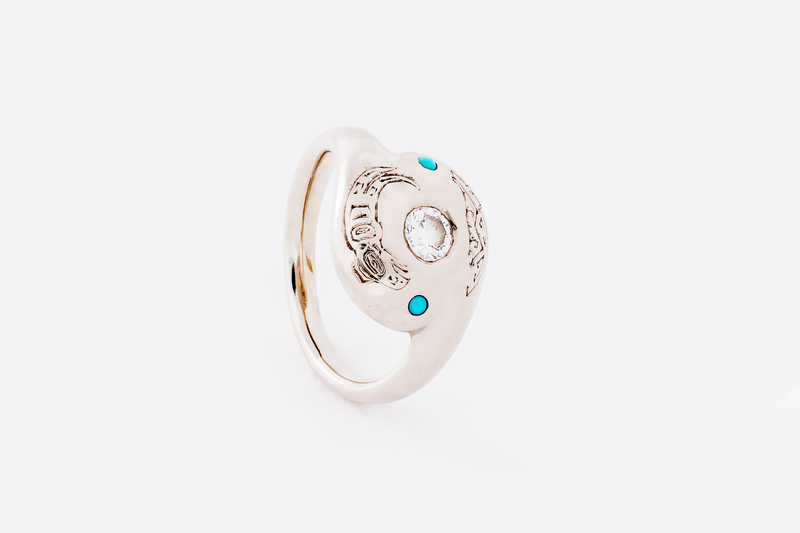 Turquoise is one of the key signatures of New Mexico, so we decided to add two small stones at the edges of the ring. Yoav carefully stashed prints of each iteration at my desk, keeping the process a secret. Once we agreed on the final design, he printed a version and sent it to a good friend who is an expert caster. 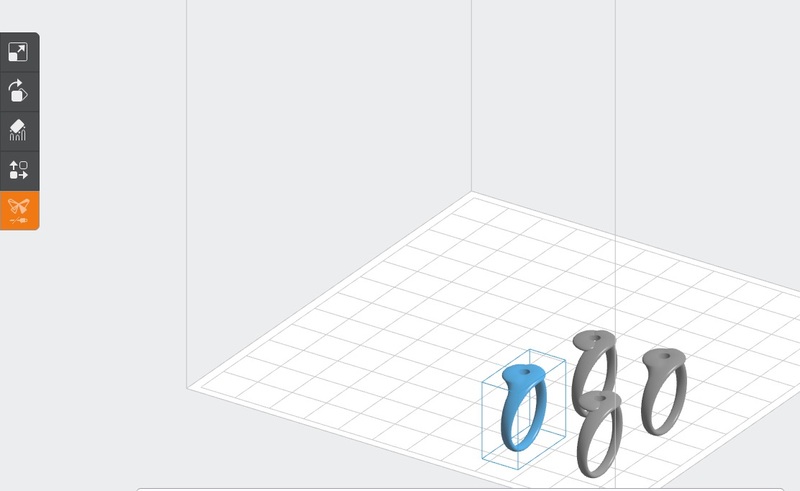 Use the 3D print to get a much more realistic feel of the ring's dimensions. It is so hard to use a computer rendering to judge the final product, how it will fit, and how different features will seem on an actual hand. Luckily prints are getting cheaper, so you can go through a few drafts before making the biggest commitment of your life. I also suggest having someone who knows what they are doing. Not only would it have taken me forever to design this myself, the ring would have been&hellip;disappointing. Once you have that help, don't be afraid to iterate and explore until your design hits those truly emotional points that make it unique. Iteration and customization are exactly the point of digital fabrication, after all.